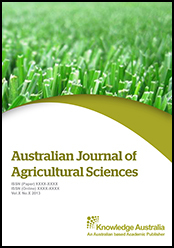 The Australian Journal of Agricultural Sciences (AJA) is an international peer-reviewed academic journal dedicated to the latest advancement in this area. The goal of this journal is to provide a platform for Agricultural Sciences researchers, policy makers and academics all over the world to promote, share, and discuss various new issues and developments in related problems. All manuscripts must be prepared in English, and are subject to a rigorous and fair peer-review process. The scope of the journal includes (but not limited to): Agribusiness, Agricultural science, Agroforestry, Agronomy, Animal husbandry, Extensive farming, Factory farming, Farm Free range, Industrial agriculture, Mechanised agriculture, Intensive farming, Organic farming, Permaculture, Stock-free agriculture, Sustainable agriculture, Urban agriculture.